I feel like i’m the last person to have seen this movie. 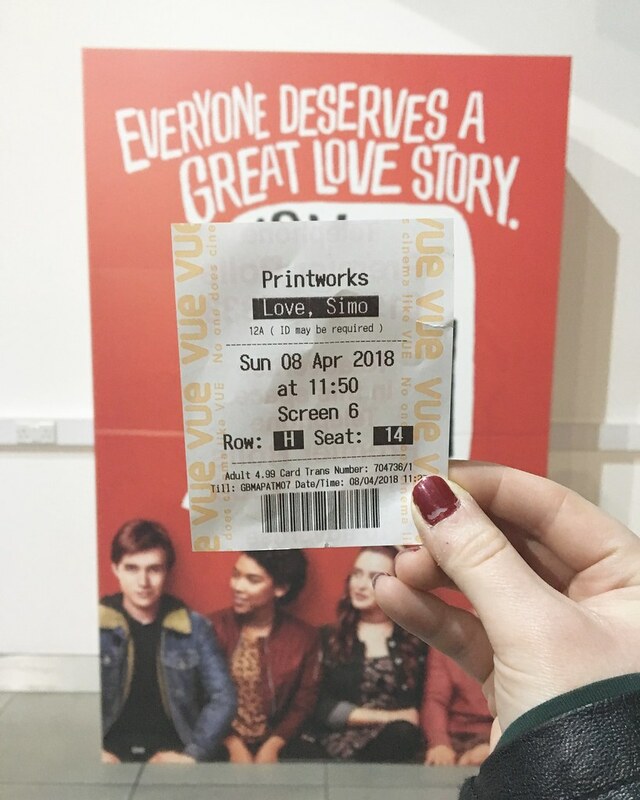 Every blogger i know and friend i have has already been to an early screening of Love, Simon – and to be honest, i have been gutted that i’ve had to wait so long. At the earliest chance i got i took myself off to the cinema and cried my way through the movie. I first read Simon Vs a long time ago. It must have been two or three years ago when i first immersed myself in this world. I wanted to read it when it was very hyped, and i’m so glad i did because i got to see this wonderful franchise grow in to what it has become now. I loved the book when i read it, and it’s a four and a half star rating for me. Which means when the movie got announced i was equally as excited about it. It’s been a long time coming for anyone who has been excited about this from the start. It’s been a long time from the announcement to finally being able to see it on the big screen. Honestly, it was worth the wait. Over the last year or so i have tried hard to ignore the comments about casting, ignore the media posts about the changes and more so ignore the criticism for Love, Simon before it was even released. There’s been a lot of comments on the cast and having some very unusual choices for the characters, but once you watch the movie, you forget about all that. Personally, i think the casting for Leah was perfect (although very different to book Leah), i also think Nick Robinson was the perfect Simon. Previously i’ve only seen him as Olly in Everything, Everything, but having loved him in that i figured he’d be the perfect Simon. He played him exactly how i imaged Simon to be, a little awkward and a regular teenager. I’m so happy they kept his personality the same as it comes across in the book. The one casting that i was unsure of was Keiynan Lonsdale. I have been a fan of him for quite some time as his role in The Flash, so i was unsure how i would take to him in a teen movie. Turns out i think he’s incredible. Bram is my favourite character from the book and i’m so happy that the same characterisation came out (ha) in the movie. He was absolutely perfect. I also want to mention that the casting of Simon’s parents were perfect for me. There were obvious changes too the movie, which i actually did not mind at all. There is obviously a lot of controversy about changing a book to a movie and what is acceptable to change and what is actually needed for the story. But what was created with Love, Simon is a separate entity of a production that worked so well as a stand alone. There was no extra information needed from the book and everything made sense. This isn’t always done very well, but without a doubt this was one of the best things about the story. The representation in this movie is incredible. It’s everything i needed as a sixteen year old gay kid. The movie is so obviously LGBT without pushing it down your throat (which i’m always worried about when talking about anything LGBT, it always seems to be slightly overkill). It shows the reality of being gay and hiding yourself from your family and friends. Nick Robinson did a great job in portraying the nervousness around that and how a seventeen year old might deal with it. It had such a positive LGBT rep that i think is desperately needed in mainstream movie at the moment. There is no big reveal of Simon being gay to the audience or even any coming to terms with it, it’s just there. Love, Simon has made it to the top of my favourite teen movie list. It’s got interesting characters, a good plot and more over has great representation. I spent a lot of the movie fangirling over Bram and loving Simon more than i ever have done. I also might have spent a lot of the ‘coming out’ scenes crying. It really does draw out every emotion. Love, Simon is a great feel good movie. I need to see this over and over and give all my money to this production.